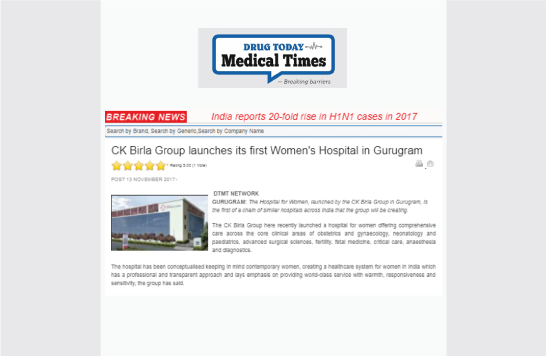 The CK Birla Hospital for Women offers comprehensive care across its core clinical areas of obstetrics and gynaecology, neonatology and paediatrics, advanced surgical sciences (including cancer, laparoscopic, gastrointestinal, bariatric, breast, head and neck surgery), fertility, fetal medicine, critical care and anaesthesia and diagnostics. The hospital also offers a full range of specialities in-house and on-call including cardiology, endocrinology, urology, dermatology and cosmetology. With a strong emphasis on wellness and preventive care, they offer supplementary therapies and improved antenatal and post-natal care and support for a natural birth.